We welcome back guest author Robert M. Wilson. 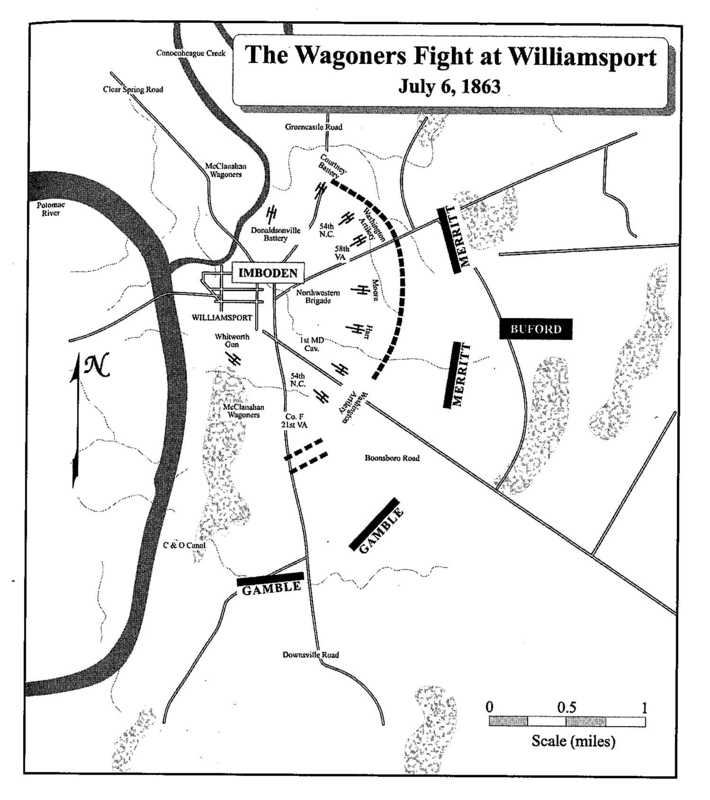 The long wagon train of the wounded led by John Imboden, a Brigadier General in the Confederate cavalry, filed into Williamsport during the afternoon and evening of July 5. The first of the hundreds of wagons on the forced march had begun their 40 mile journey late afternoon the previous day. As the caravan persevered through downpours and over rough, muddy roads, it had been intermittently attacked by Union cavalry and stormed once by angry axe-wielding Pennsylvanians. That ordeal had ended. But a whole new ordeal was about to begin. The next day the wagon train was supposed to be in Virginia and heading towards Richmond. Instead, it sat clogging the river town’s streets. The rain swollen Potomac River was too swift and too deep to ford for the time being, and a band of Yankee marauders had destroyed the nearby pontoon bridge Confederate engineers had built for Lee’s invasion. The Union attack occurred the afternoon of July 6 when a cavalry division under command of Brig. 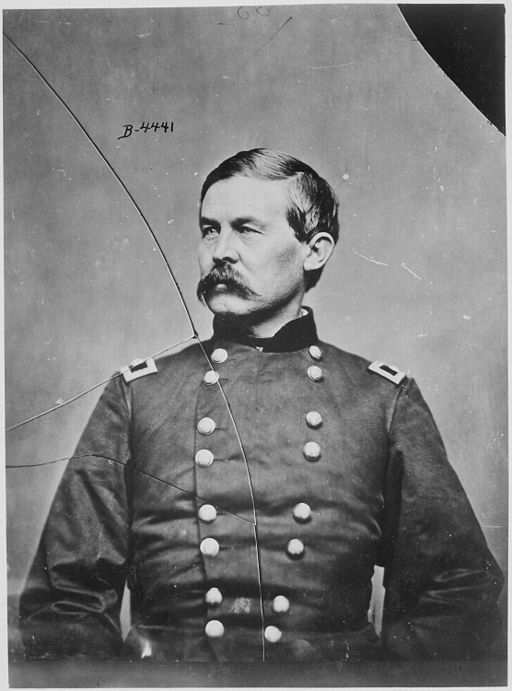 Gen. John Buford rode on Williamsport. Brig. Gen. Hugh Judson Kilpatrick and his cavalry troopers later appeared to join the fray, riding in from their failed attempt to force Stuart out of Hagerstown and occupy the strategic crossroads there (see Part 4 of this series). 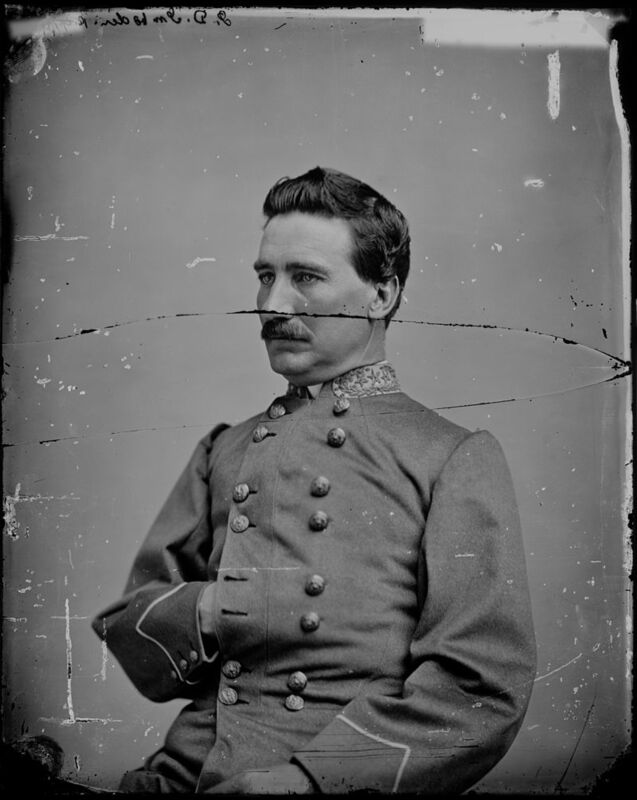 As he had done by successfully organizing, leading and defending his wounded men and their caravan to Williamsport, Imboden once again showed himself a practical and capable leader and proved Stuart’s opinion wrong. Marden was right to speculate that “the whole thing” regarding the Union army attacking versus Confederates escaping across the river might be decided before his letter was received. It would be, but not exactly in the Union’s favor. The rain and the river would turn out to be fickle allies. This entry was posted in Battlefields & Historic Places, Battles, Personalities and tagged 1st United States Sharpshooters, A Sharpshooter’s Postscript to Gettysburg, Battle of Williamsport, George Marden, Gettysburg retreat, John Buford, John Imboden, Robert E. Lee, Wagoneers, Williamsport. Bookmark the permalink. Thanks David! More posts on the retreat/pursuit to come. My research to date has shown very little difference at high command levels between West Point men and others. Sometimes the West Pointers had such high expectations put on them that they were bound to disappoint, but there was certainly a lot of disappointment to go around. Again and again I read of men–North & South–who saw their appointment to the military academy as a sure way to be able to skip a few social steps in the ascent to the top of the social ladder (I guess Grant is the exception that “proves” the rule–lol). Rarely do they mention their duty to country, or anything else very patriotic. It is interesting to see that the officers who were political or social appointees did as well as those who were professionally trained, and several Northern officers continued to be involved in Union building after the war–Sickles, Howard, to name two. I never thought to consider John Imboden as anything other than a talented and honorable officer. Stuart? Sometimes his glowing silver armor looks a little tarnished in places. Dear Mr. Wilson: I take umbrage at your choice of words in the second paragraph above. Your use of the words “a band of Yankee marauders” is not factually correct. The Union military force sent to Williamsport to destroy the pontoon bridge was under direct orders from Major General William H. French at Harpers Ferry. Based on a strong intelligence report from Colonel Andrew McReynolds, commander of his cavalry brigade, General French approved a plan to destroy the pontoon bridge at Williamsport and issued orders to do that on July 3. Major Shadrach Foley was chosen to command a special force of cavalry of about 300 troopers, composed primarily from his own 14th Pennsylvania Cavalry, with others from the 1st New York Cavalry, 13th Pennsylvania Cavalry, and 1st W.Va Cavalry. Major Foley and his men left Frederick at dusk on July 3, passed through Boonsboro, and arrived at their objective before dawn on July 4. They dismantled and destroyed the pontoon bridge as ordered, surprised and captured a small Confederate force nearby at Falling Waters, and destroyed Confederate ammunition, supplies, and equipment. With the threat of rain and approaching daylight, Major Foley and his command withdrew and headed back to Frederick-not one officer or trooper was injured or lost in the mission to Williamsport. This was a tactical military decision made by Major General French, with a military objective and with command-and-control in place from beginning to end. In no way can the men of this cavalry force be described as “a band of marauders” (plunderers). I am afraid your Confederate slip is showing, Mr. Wilson. Dear Miriam: My choice of the word “marauders” to describe the federal cavalrymen who attacked and destroyed the pontoon bridges was a poor one. I didn’t mean to convey that they were acting as privateers. I intended to describe them as “attackers,” and I see that “marauder” has that more negative connotation, of acting outside of the law or military rules of engagement. I am well aware they were, in fact, conducting a military operation. And I see that my poor choice of words could convey that they were not. Thanks for pointing that out.